4) Once you got the unique coupon then Note down and Now we can use it to get Rs 15 to 30 Paytm cash. 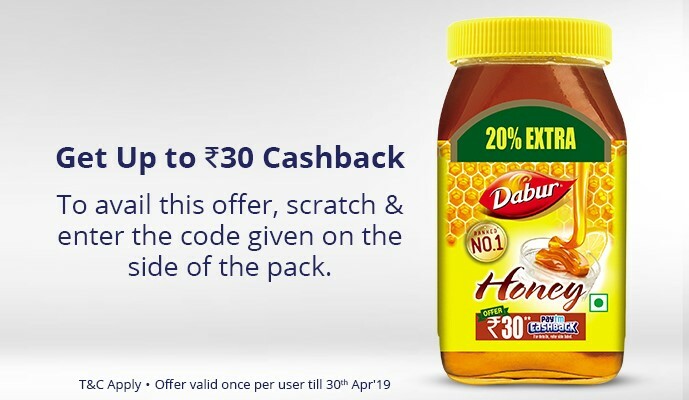 2) Enter the amount and click on ‘Have a Promocode” >> And Enter your Unique Cash code which you got from Dabur Honey Pack. You can use this offer once. Participation in this Promotion namely, Paytm Dabur India Ltd (“Offer”) is purely voluntary and optional. This Offer is not valid in conjunction with any other Offer. Products also available without this Offer. By participating in this Offer, each participant is deemed to have accepted these terms and conditions. This Offer is being conducted by Dabur India Ltd. in association with One97 Communications Pvt. Ltd. (referred to as Organizer) on www.Paytm.com (‘website’), for Products defined hereinafter. After purchasing the products, look for the unique Paytm code (“Code”) printed on the back of the packets. After getting this Code, the participant can scan the QR code or go to paytm.com/honey and enter the unique code to get Paytm Cashback. Paytm cash is the term used to define Paytm cash that participant gets when he applies the code on Paytm website while making a transaction. The cash earned this way is stored in the Paytm wallet and is used to purchase products/do recharges on Paytm website only. No cash would be given in lieu of Paytm cash. Participants can buy all products and services offered on Paytm.com or Paytm app with the cash they collect in their Paytm wallet. In case user purchases a product or service that is greater in value than the amount of cash user has collected in Paytm wallet, user would have to pay for the differential amount through any of the payment means available/accepted on Paytm. It can be used to purchase talk time or DTH recharge or purchase of physical goods after accumulation of Paytm Cash in the Paytm wallet. Paytm cashback offered as part of this offer is non-transferrable, non-refundable; and no physical cash payment will be made in lieu of this. At any stage, Dabur India Ltd. and/or Paytm reserve their right to call upon the Participant to submit any document for verification of identity as per its sole discretion. Neither Dabur India Ltd, nor will Paytm.com be liable for any delay in actual redemption under this Offer reflecting in the customers’ account. Paytm and Dabur India Ltd. will not be responsible for any loss or damage to the Code. At any time Paytm and/or Dabur India Ltd. reserves the right to update and/or amend all or any of these terms without further notice. Dabur India Ltd.and/or Paytm reserve the right to cancel, change or substitute Offer at any time without any prior notice. Dabur India Ltd.and/or Paytm may require participants to participate in promotional activities (such as publicity and photography), free of charge, and he/she consents to the usage of his/her name, photograph, film recording, portrait, picture, voice, likeness and biographical information for media coverage, news or information and for advertising or promotional purposes in any media for an unlimited period without remuneration. The foregoing license shall survive any termination or expiration of this Offer. 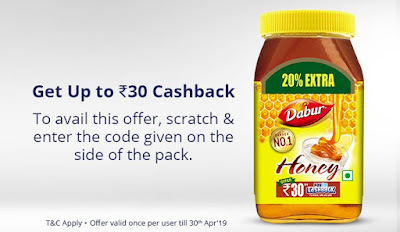 Dabur India Ltd.and/or Paytm shall not be responsible for any loss, injury or any other liability arising out of the Promotion or due to participation by any person in the Offer. Dabur India Ltd.and/or Paytm shall not be liable for any loss or damage due to Act of God, Governmental actions, other force majeure circumstances and shall not be liable to pay any amount as compensation or otherwise for any such loss.